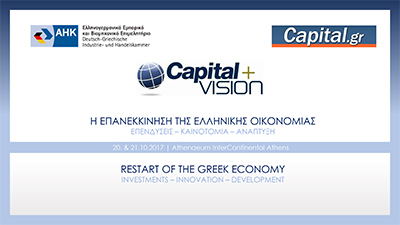 Τhe German-Hellenic Chamber of Industry and Commerce, the «Capital» newspaper and Capital.gr, will host the conference Capital+Vision 2018. Capital + Vision has been established as an institution for the Greek business scene. It consists of the main conference and a number of parallel events, which are organized by public and private institutions, innovative companies and representatives of the productive forces of the country. The purpose of the two-day conference is the search for synergies and new partnerships between Greece, Germany and other countries. Prominent political personalities and senior executives of the business world participate at the event. Taking into account the priorities of Greece, the Capital+Vision 2018 focuses on Growth and Investments as prospects for the Greek Economy. Find the Agenda of Capital+Vision 2017 HERE. and the Overview (PDF) HERE.